I’ve made maple syrup for over 40 years now. It is a costly, time-consuming process since the tree produces maple sap at around 2% sugar content and one needs to boil over 43 gallons of that sap in order to get a gallon of syrup. My syrup is made from my own trees. Maple Syrup is unique in that the plant that produces the sugar is not harvested and requires no fertilizer or pesticides in order for it to be produced. It is naturally an organic product. I have a sugar bush (lots of Sugar Maple trees) on my property and link the trees by tubing to a central collecting point. I then concentrate the sap using a reverse osmosis system and then boil it until it reaches 7 degrees Fahrenheit above pure water boiling temp for that day (boiling temperature varies dependent on, among other things, atmospheric pressure). The syrup is then filtered and bottled for sale. The only thing that has to be added to maple in order to produce it is a defoamer while it is boiling. Most producers use a commercial chemical mix, I use butter. The amount of butter I use is insignificant- about a teaspoonful per 5 gallons of syrup. There are no regulations that require a producer to list the defoamer they use. I list the butter on my label. I grade the syrup using standard industry approved grading. Most of mine is Grade A Dark Color with a Robust Taste. What this means to you is that it is the best tasting maple syrup you have ever had! 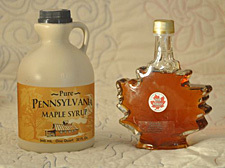 I sell by the quart in plastic bottles and in a decorative maple leaf-shaped glass bottle that contains 250 ml of syrup. The latter makes a perfect gift for a friend! The former makes an excellent gift to yourself!